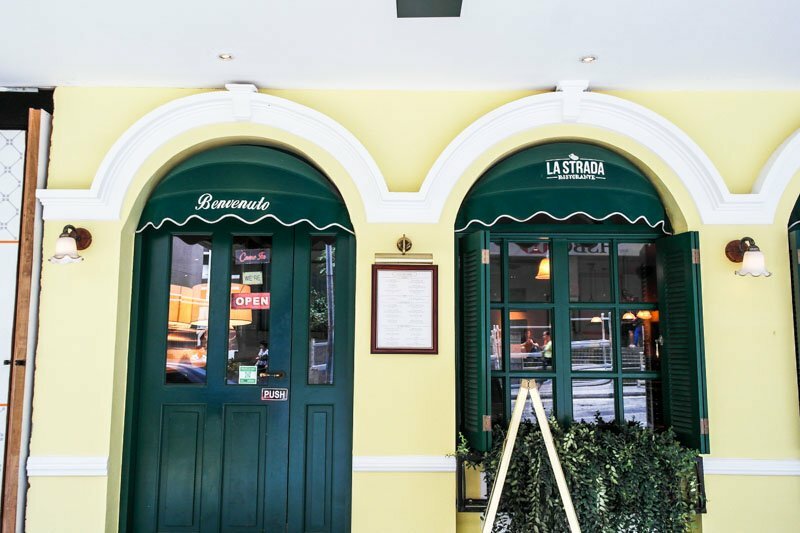 La Strada by Les Amis Group has returned, this time to the diner stretch along Shaw Centre that is flooded by the restaurant group’s eateries. The purportedly “trattorian” makeover features new head chef, Yakuza-looking Chef Joon Kian Pow who brings his over-a-decade-long fine dining experience to the Italian ristorante. Other than his Gu Wak Zai 古惑仔 devilish good looks, Chef Joon has some mean cooking skills as well. Entering vintage green-painted doors takes you into a humble interior furnished much like a home, with low-hanging dining spotlights on wood tables and striped upholstery. A dainty chalkboard announcing the daily chef’s specials lies among the throng of photo frames on fresh mustard walls. On this day, we were to be given our own set of specials from La Strada’s delectable spread of Italian cuisine. Char-grilled Piadina with Mushroom & Ham Toppings ($28++). 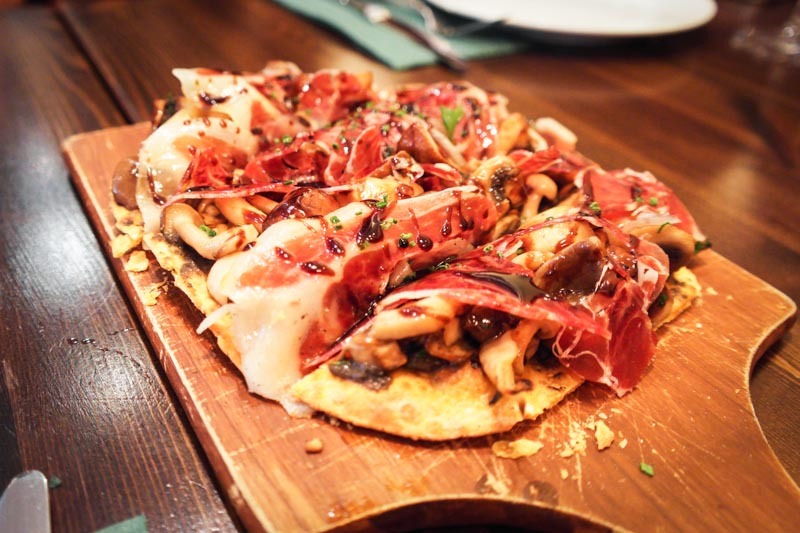 Dressed like a pizza is the char-grilled Piadina that is served pre-sliced, but its generous combination of porcini mushrooms and parma ham in melted cheese on bread sets you up for a messier affair than pizza. When the sweetly brown balsamic gushes out from the tight bite, though, the blend is excellent. Tomino Cheese with Parma Ham ($28++). 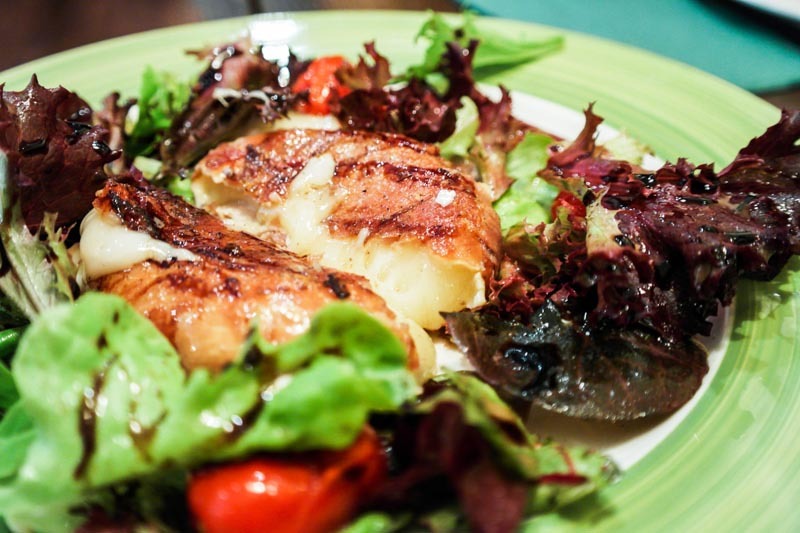 This scrumptious block of lightly grilled tomino cheese is a pot of gold with a rather crisp coat. Take a slice to see how the melted goodness within is slowly disgorged, but attached to the coat for the most part. Perhaps the only price to pay in this incredibly warming delight is the adherence of hardened cheese to the gums. Homemade Egg Pasta ($18++). 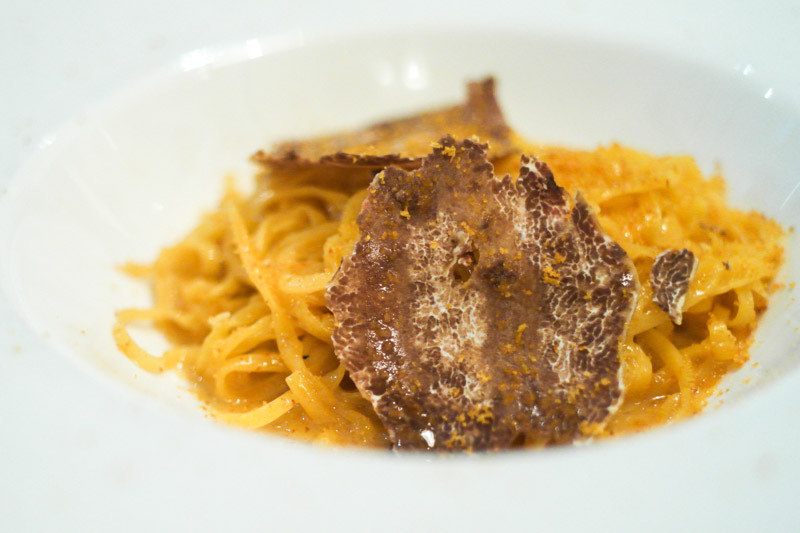 Lightly peppered with grey mullet essence is the homemade egg pasta that is sodden in fragrant white truffle, whose skin conceitedly rests atop the noodle. There is a certain brilliance to the springiness and absorbency of the linguine that plays a sprightly contrast to the dry fishy powder, elevating this dish above the rest with that extra umami layer. Simplicity at its best. King Crab Risotto ($80++). Punctuated by the flavours of the glorious Alaskan King Crab, this risotto lets you experience some royalty with the savoury crab consommé and soft grains speckled with a generous serving of crab flesh. Within the bowl lies also a shelled portion of the giant leg as well as more truffle slices. 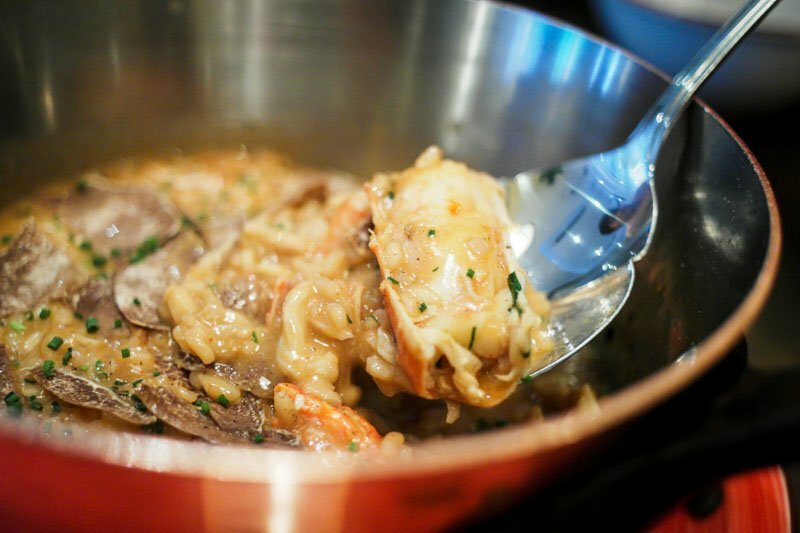 The risotto grain is cooked to a softer texture more to the local taste. Insalata di Polpo ($28++). 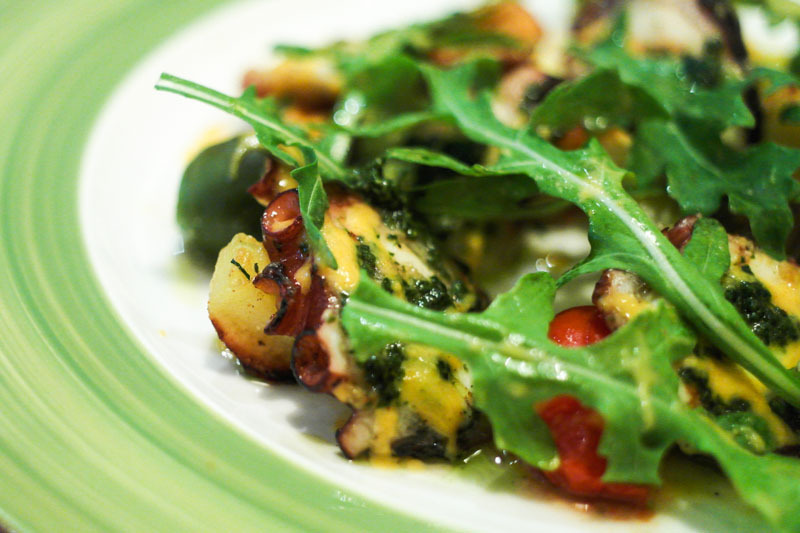 The slightly sour miscellany of green olives, crushed potato, pickled onions, and flashed-grilled octopus leg with a dash of pesto and rocket is so varied in texture for it not to be considered a toothsome antipasti. Cremagliera di Agnello Alla Griglia ($38++). 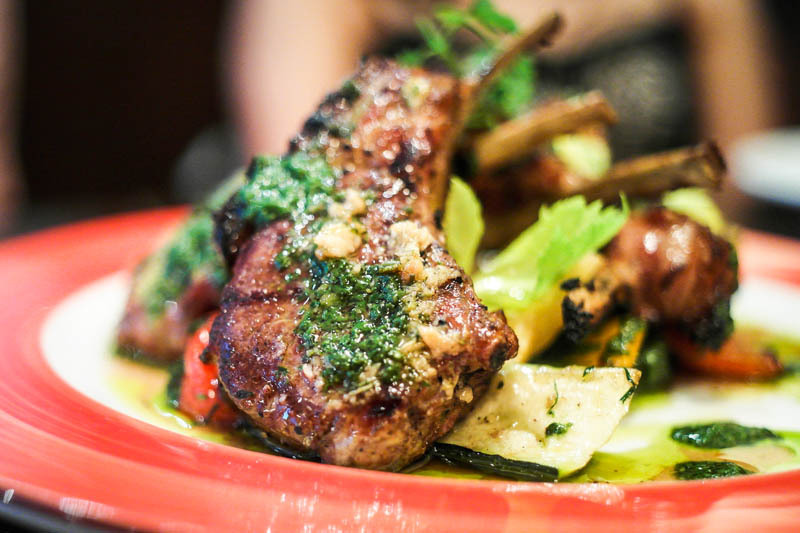 Delectably chewy (but not tough) is this sizable char-grilled Welsh lamb rack that is teeming with juice and separated from the bone with ease. The roasted vegetable ratatouille on the side is a flavourful reprieve from the carnivorous adventure. 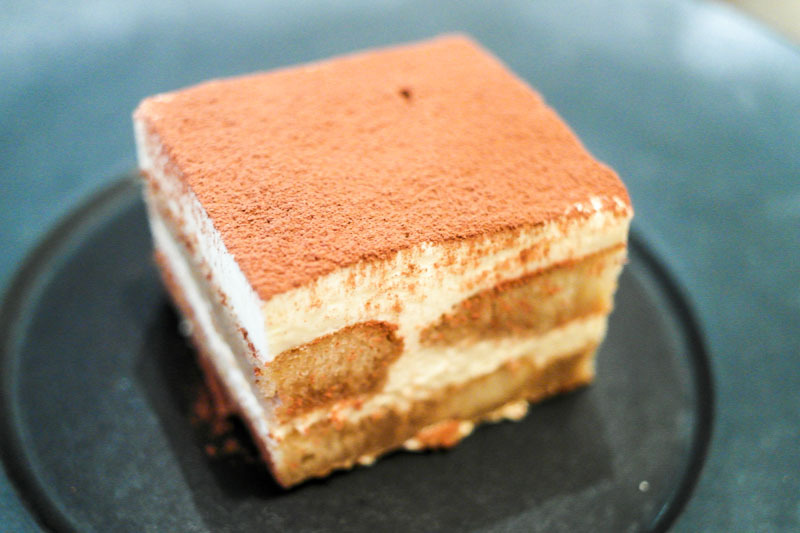 Tiramisu ($15++). If you were searching for a palpable taste of liqueur, the tiramisu here would be absent that, but it otherwise does a good job at providing the sweet and rich mishmash of masacarpone layers. 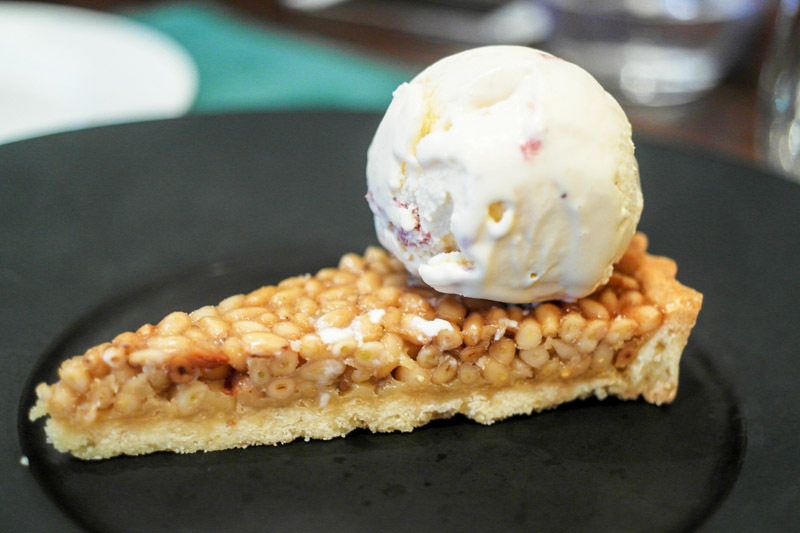 Honey & Pine Nut Tart ($15++). Imbued with pine nut, the sturdy exterior quickly crumbles in the mouth for a honey-coated crunch, tasting rather like a deconstructed strawberry pocky stick. As we were finishing the final courses, Chef Joon informed us of his stringent demand for his restaurant to use only the finest ingredients. Perhaps it is this feather in his fine culinary cap that truly lifts the restaurant from its former image. 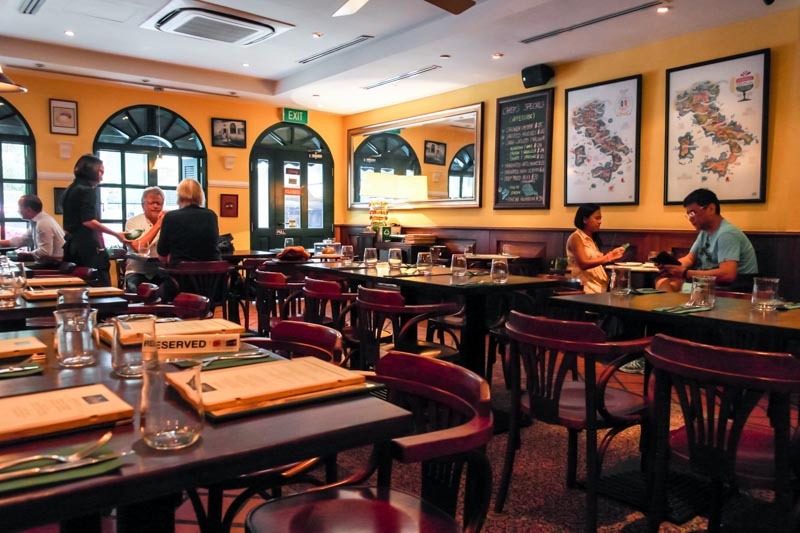 Pretty reasonably priced with simplicity and finesse in execution, this is what makes La Strada a worthwhile visit.